The cargo of the San José includes ceramics and potentially up to $20 billion in gold, silver, and jewels. A plan to recover what may be one of history’s greatest treasure troves from the wreck of a Spanish galleon could be set in motion on July 23. The administration of outgoing Colombian president Juan Manuel Santos has set a deadline of July 23 for prospective salvors to submit proposals for excavating the San José, a 300-year-old wreck off the Colombian coast. Estimates of the value of the San José’s cargo of gold, silver and jewels have ranged from a few billion dollars to more than $20 billion. 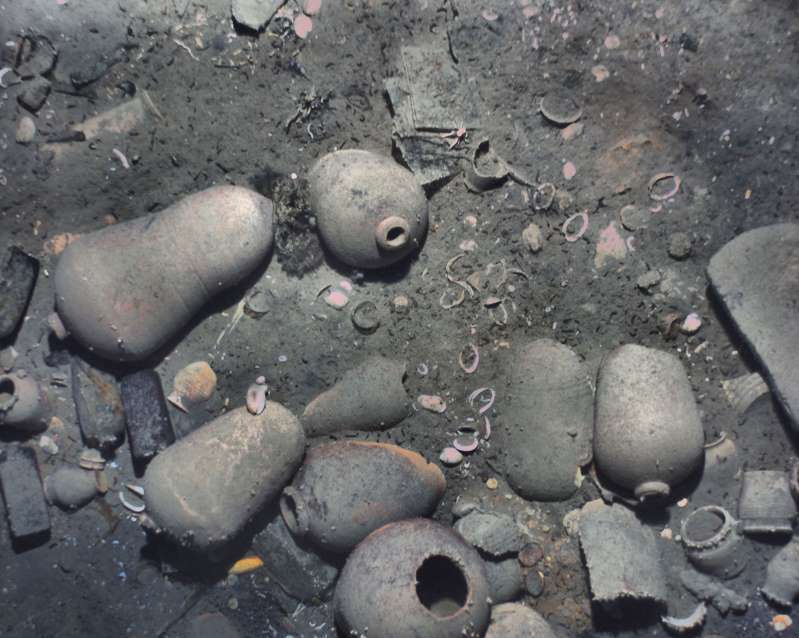 A recent investigation by the office of the Colombian attorney general concluded that the Santos-led effort to hire a private salvor to excavate the San José—and in the process recover a treasure worth billions—was improperly conducted and that any contract resulting from the flawed process would be invalid. [post_ads]The firm most often mentioned as the one likely to get the contract for the San José project has been a Switzerland-based company, Maritime Archaeology Consultants (MAC). At present, they are the only firm that has submitted a proposal to the Colombian government. Incoming Colombian president Iván Duque, who takes office August 7, said during his election campaign earlier this year that the process by which Santos and his colleagues had conducted the search for a salvor had been shameful ("vergonzoso") and that doubts about the process should be clarified. Duque has not commented publicly about the San José project since his election in May. If MAC is awarded the contract, a U.S. firm has vowed to sue the Colombian government to halt the excavation of the San José. Jack Harbeston, director of Sea Search Armada (SSA), says his company has a legitimate claim to half of the San José treasure. SSA’s claim dates back to 1981, when the company says it found the wreck in the Caribbean Sea about 11 miles offshore from Cartagena. “We are prepared to file several legal actions in Colombia, and to pursue, with the U.S. Department of Justice, remedies under the Foreign Corrupt Practices Act,” Harbeston said. Harbeston said his company had a contract at the time with the Colombian government granting it half-ownership of the wreck if they found it. Shortly after SSA revealed the location of the San José to Colombian officials, Harbeston said, the government passed a law claiming ownership of the wreck, reneged on its contract, and began a long legal battle to invalidate SSA’s claim. SSA countered with legal action against the Colombian government. In 2007, the supreme court of Colombia ruled that SSA’s claim to 50 percent of the treasure was valid. In November 2015 the Santos administration announced that a Colombian expedition that included archaeologists from MAC and the Woods Hole Oceanographic Institution in Massachusetts discovered the San José wreck site, ignoring SSA’s claim that their divers had found the wreck decades earlier. The location of the site was not disclosed. Officials at Woods Hole did not return phone calls seeking comment on the institution’s participation. Following the Colombian government’s claim of discovery, SSA made public the previously secret coordinates of the wreck as proof of their claim to the San José. David Moore, an underwater archaeologist with the North Carolina Maritime Museum in Beaufort, said estimates of the riches aboard the San José have been based on its sister ship, the San Joaquin, which was built by the same shipbuilder and was nearly identical to the San José. In a 1991 article for The Mariner’s Mirror, historian Carla Rahn Phillips said the San José and San Joaquin were part of a Spanish fleet transporting several years’ worth of taxes and business profits owed the Spanish crown from Portobelo in present-day Panama to Spain. The two galleons, armed with more than 60 guns each, were among the most powerful warships in Spain’s fleet. In 1708, Spain and England were fighting the War of Spanish Succession, and English warships were in the Caribbean. Around sundown on June 8, the Spanish fleet came under fire from English ships. Darkness had settled over the battle when the San José suddenly went up in a spectacular explosion. Burning planks and splinters from the doomed galleon showered down on the combatants. The San José “simply disappeared,” Phillips wrote, “sinking almost immediately after the blast.” Only 11 members of the ship’s crew of more than 600 survived the explosion. But the San Joaquin survived the battle and returned to Spain with its immensely valuable cargo. The ship’s paperwork also survived, giving historians some idea of the wealth that went down with the San José.